Meticulous preparation for travel, whether brief or extended, has always seemed to me a necessity for having the best trip possible. A recent trip to Savannah, GA, disproved that personal theory. The Nov. 22-24, 2009, excursion was a delight, in spite of the fact that we did little preparation. 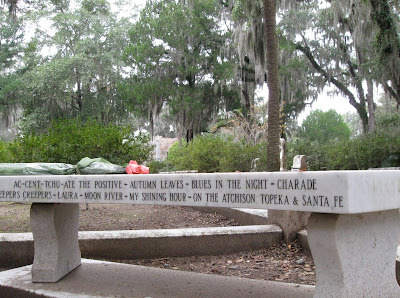 What we did do was read Midnight in the Garden of Good and Evil, referred to in Savannah as “The Book.” Author John Berendt weaves a tale, based on fact, of murder, the Savannah’s elite, and over-the-top characters. 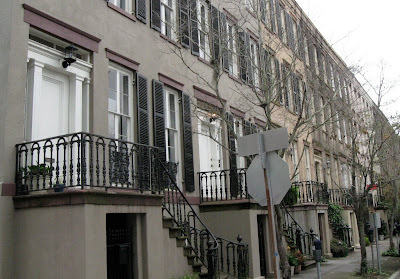 The action plays out against the backdrop of picturesque locales and the personalities engaged in rescuing and restoring Savannah’s historic residences and buildings. It was entertaining and, better than any travelogue, sparked a desire to see the Savannah of “The Book.” Walter also rented the DVD, and we snatched opportunities to watch the movie in installments over several days. 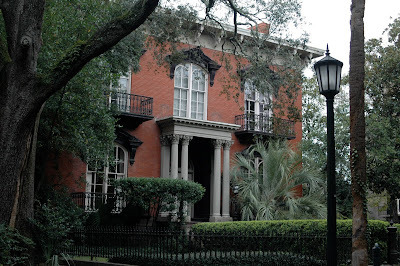 We were in Savannah about 40 hours, arriving on Sunday and leaving Tuesday after lunch. 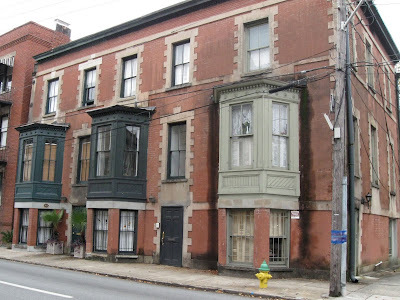 And just as described in “The Book,” old homes in use and in various stages of restoration were evident in any casual stroll in the historic district. We did not take any kind of tour, and I had little idea of the history of the intriguing structures I noticed, except when dates were noted on the facades. 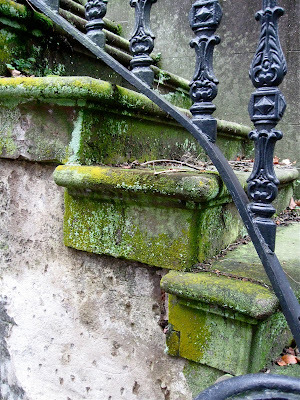 An oval plaque labeled this block above, for example, as constructed in 1852.
and those in need of rejuvenation. 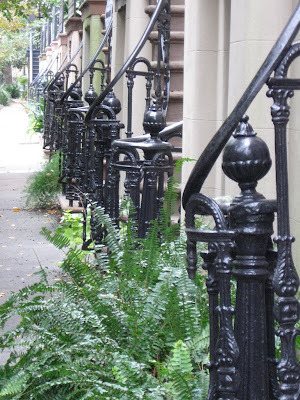 All shared wonderfully crafted wrought-iron newel posts and handrails. Another pre-trip experience introduced us to the Savannah connection to Moon River, a favorite song of Walter’s. 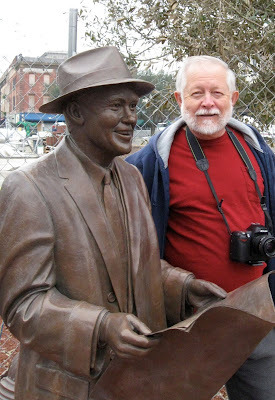 One evening when we had both collapsed in front of the TV, Walter flipped through the channels and landed on a special about Johnny Mercer, the songwriter and singer responsible for creating the lyrics of more than 1,000 songs, including Moon River. 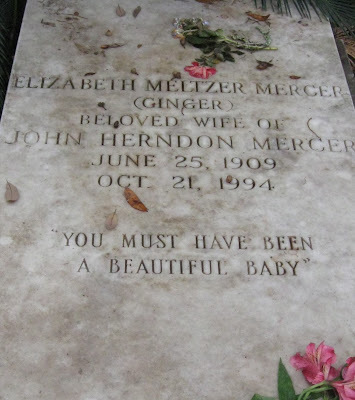 Turns out Mercer was a Savannah native. This statue of Mercer is at Ellis Square near the historic City Market. The one on the right is my husband Walter. Walter isn’t the only fan. Many of Mercer’s songs created a memorable accompaniment to my early years in the 1950s and early 60s. 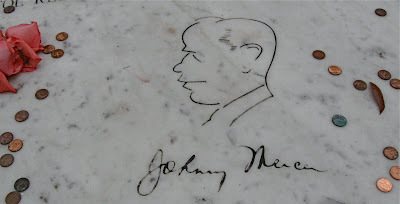 Bonaventure Cemetery was already on our to-see list from reading “The Book.” We added finding Johnny Mercer’s gravesite to our list. 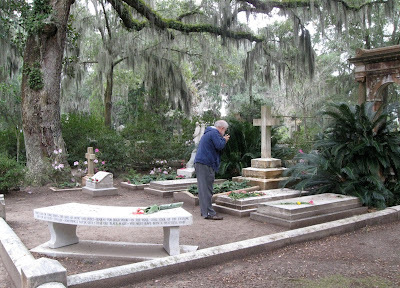 Old Savannah families evidently take marking the graves of departed relatives extremely seriously. 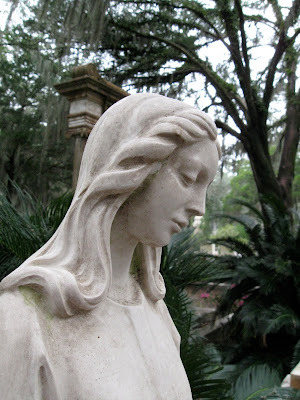 Tombs, towering obelisks, large angels and other distinctive markers appeared through a green curtain of shrubs, sago palms and the branches of enormous oaks draped with trailing tendrils of Spanish moss. The afternoon of our visit was overcast, heightening the sense of drama. 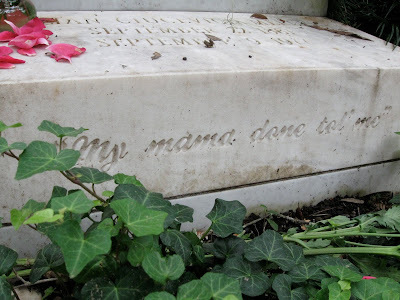 The Mercer’s family plot did not disappoint. A bench engraved with a number of his most famous song titles, his signature and a caricature of his profile occupied a corner of the plot. 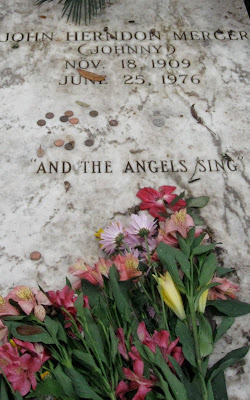 Visitors had left flowers and pennies on the bench and on his grave. 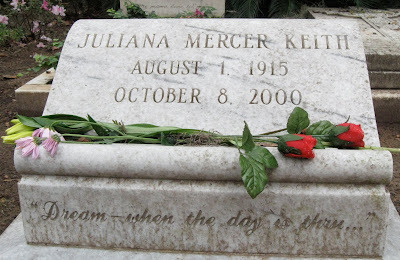 They had adorned the other Mercer graves with roses and other blooms. Mercer lyrics were also in evidence. When we left Bonaventure Cemetery, we drove over the towering Talmadge Memorial Bridge spanning the Savannah River. We headed to Tybee Island, just to walk along the Atlantic for the first time since 1989. 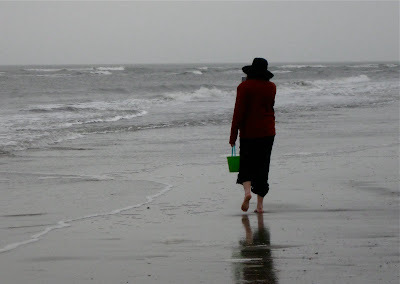 Even on this blustery, overcast, rainy afternoon, the lure of the ocean had folks out walking the beach. Admittedly, our method of sightseeing in Savannah could hardly be classified as organized. I would put it in the same category with meal preparation and cleanup when we camp – the “mosey” method. We do a little bit, mosey over here or there, do a little bit more, mosey back again until it is all done, or in the case of Savannah, until we had to leave for home. It was great! But we plan to go back. There is still more to see, to do and to just be, our favorite travel activity.